Iranian Foreign Minister Javad Zarif and the EU's foreign policy chief Catherine Ashton decided today to postpone the Geneva agreement implementation talks until after Christmas holidays. 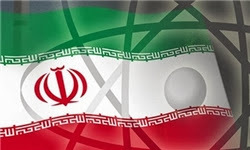 The implementation talks between Iran and P5+1 ended abruptly when the Iranian delegation walked out in protest to an American decision to add 19 new Iranian entities to the existing sanctions still in effect. The talk’s resumption and its progress generally have been slow because of what Araqchi described as different “interpretations” of points of the agreement between Iran and world powers that was signed in Geneva on 24 November. “The talks on implementing the accord are not easy. They are progressing, but slowly,” Zarif told a joint news conference on Sunday with visiting Italian Foreign Minister Emma Bonino. ALONG the way!,somewhere on a sharp bend, the Empire will loose the argument, and find that the only option is to grab the cup of poison ! !.-BUT before that time comes, She has a lot of tantrums -threats and cruel jokes!!. Patience is the only noble weapon to win her heart! !